I won’t give you any advice on making health-related New Year’s resolutions. People rarely keep their resolutions, and I don’t want to waste your time. Health-related goals, though, are another matter. Resolutions can seem punitive (“I resolve to give up [something]”) whereas goals are more positive, or that’s how it seems to me, at least. Resolution: I’m going to stop smoking. SMART Goal: I’m going to decrease the number of cigarettes I smoke by one each day and then stay a non-smoker when I make it to zero. You could make that SMART goal even smarter by defining the number of days it will take you to reach zero. Everyone has health goals but there is one in particular that strikes me as most important: cultivating happiness. Happy people tend to be healthier and more resilient. Happiness is not all in your mind, or in your heart. New research seeks to clarify the mind-body connection by highlighting bodily sensations associated with specific feelings. 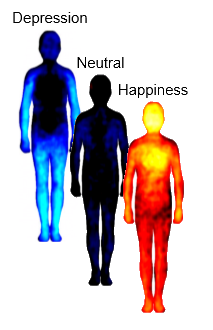 The researchers found that emotions like depression and happiness seem to manifest as sensations throughout the body, whereas some other emotions, such as envy, were more localized. While the researchers didn’t comment on this, it seems possible that the more an emotion expresses itself through bodily sensation, the greater its potential to impact on your health. What would your SMART goal related to health and happiness look like?